For everyone who's been watching Avengers: Infinity War nonstop since it finally dropped on Netflix, put down the remote. Stop putting yourself through that emotional turmoil. Instead, choose a lighthearted alternative that's bound to get your juices flowing in preparation for the releases of Captain Marvel and Avengers: Endgame later this year. That's right - Ant-Man and the Wasp has finally been released on the streaming service, and it's time to get serious! While the follow-up to 2015's superhit Ant-Man doesn't directly correlate to the events that go down in Infinity War, the film does drop a few gems in relation to the overall picture of what could happen in upcoming installments. All the questions left from Infinity War seem to have an answer involving time travel, and we all know that the adventures of Scott Lang and Hope van Dyne dabble heavily in that particular area. We have no clue just how much the Quantum Realm will factor into the plot of Endgame and beyond, but there's never any harm in rewatching the movie a few times to search for any clues! While Marvel fans have been waiting for Ant-Man and the Wasp's addition to Netflix's queue, it does come hand-in-hand with a bit of a bad news. With Disney rolling out its own streaming site in 2019, it means that this will be the last Marvel title to debut on Netflix. As of publication, there are currently four other Marvel films streaming on Netflix: Guardians of the Galaxy Vol. 2, Thor: Ragnarok, Black Panther, and Avengers: Infinity War. 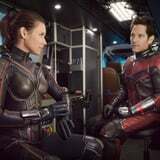 Ant-Man and the Wasp has about a year and a half online before it turns into dust, but the other films will be taken off sooner rather than later. Fans should definitely take advantage of the Marvel-ous (see what I did there?) lineup as soon as possible!